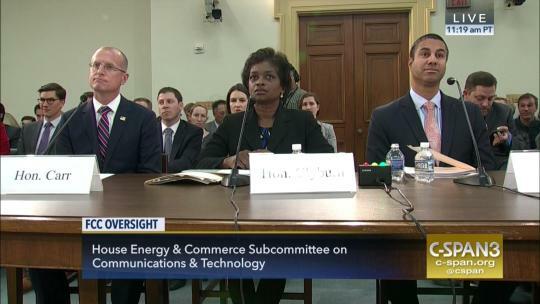 Yesterday afternoon the House subcommittee that provides Congressional oversight for the FCC held an important hearing about the agency’s current plans, including current Chairman (and former Verizon lawyer) Ajit Pai’s move to gut Title II net neutrality protections that prevent ISPs from controlling what we do online with throttling, censorship, and extra fees. With Capitol Hill’s attention now on the FCC, and Pai’s final plan to gut net neutrality protections expected in the coming weeks, it’s extra important that Congress gets flooded with phone calls from Internet users telling them to stand up and defend the open Internet. We’re also hearing there are key members of Congress considering whether to step in and force Pai to slow down. This means best chance to stop the FCC from breaking the fundamental principle that makes the Internet awesome is to pound Congress with phone calls right now. You can also just call this number directly and enter your zipcode to get connected to your legislators: 202-930-8550. 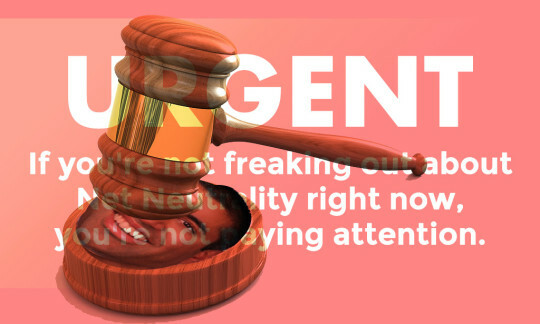 Ajit Pai is expected to circulate the text of his rule killing net neutrality on November 22, the day before Thanksgiving. Once that happens, it will move to a vote at the FCC’s open meeting in December, and it will become much much harder to stop him. It’s clear that the FCC remains set on killing net neutrality. But Congress can stop the FCC from gutting the rules that keep the web open, affordable, and awesome. I can’t stress enough how important this is. I rarely deviate from my surreal meme theme but this is something that can’t be ignored. This decision will affect the whole world! The FCC sabotaged its own public comments process. Congress needs to stop them from voting to kill net neutrality on December 14! Yesterday, the Pew Research Group released a study that triggered a number of new reports about issues within the FCC’s net neutrality comment docket. The Pew study, unfortunately, contained a number of serious inaccuracies, and lacked needed context in a way that conflated legitimate grassroots advocacy and organic online outrage with malicious attempts to manipulate the FCC docket with fraud. The original Pew study claimed that there had only been 450,000 comments during the FCC debate in 2014. There were closer to 4 million. Pew has since corrected this error after we brought it to their attention, but they have not addressed the points below. The Pew study claims that comedian John Oliver promoted our net neutrality advocacy site BattleForTheNet.com – to our knowledge that is incorrect. During his viral net neutrality segment, John Oliver directed viewers to his own page: GoFCCYourself.comThe study casts suspicion on legitimate comments using the text from BattleForTheNet.com, noting that 476,000+ were submitted at the same time on July 19. That’s because these comments were submitted as a CSV using the FCC’s “bulk upload” option, a perfectly legitimate way to submit comments to the agency, and in fact the one that the agency encouraged groups to use. Pew never asked us about this, or we would have been happy to provide them with the records of this. The study claims that the large bulk of comments came from “a small number of organizations,” and points to BattleForTheNet.com as an example. However, this is a mischaracterization of what the site is. It’s an Internet-wide coalition effort that has been promoted by dozens of public interest organizations, hundreds of startups, and thousands of websites, apps, and online communities who participated in the July 12 day of action and other campaigns. Overall, the study fails to give readers needed context to understand the difference between a legitimate comment submitted through a site that provides a concerned constituent to add their name to a default statement, and comments that were submitted using real people’s names and addresses, likely stolen from breached databases, without those people’s permission or knowledge. The study seemed to be unaware of the various ongoing investigations surrounding this issue – including a law enforcement investigation by the New York Attorney General’s office. By failing to include essential information about the comments they analyzed, the Pew study offers a distorted view of what’s happening in the net neutrality docket. 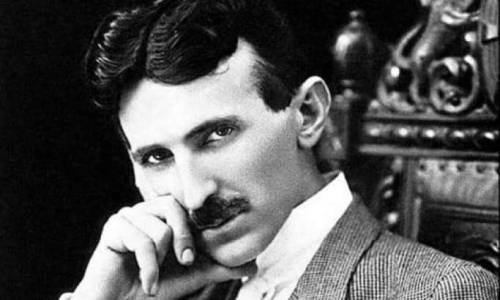 By a series of discoveries and inventions just perfected, Nikola Tesla, the electrical scientist, has upset what has hitherto been regarded as one of the fixed laws of nature. “Every effect diminishes with distance,” is the way the textbooks have expressed it. 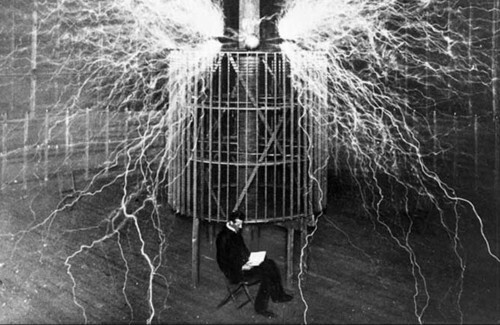 Tesla now says that instead of decreasing like other forces, electricity may be made to increase in intensity with the distance traveled. The full significance of this discovery may not be at once apparent. It is obvious, however, that it annihilates space. There can be no limit to the power of the electric wave which increases in intensity the further it travels. 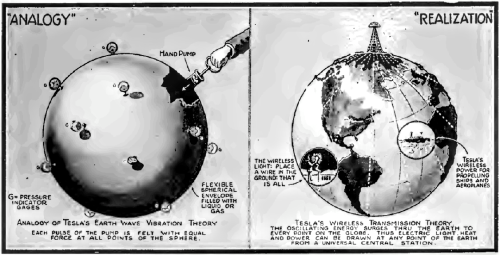 For nearly 20 years Tesla has been working on his plan, he calls it his wireless “World System.” If it is put into successful execution it will convert the earth into a gigantic conduit, which will pass power for all earthly activities, and make possible communication with other planets. 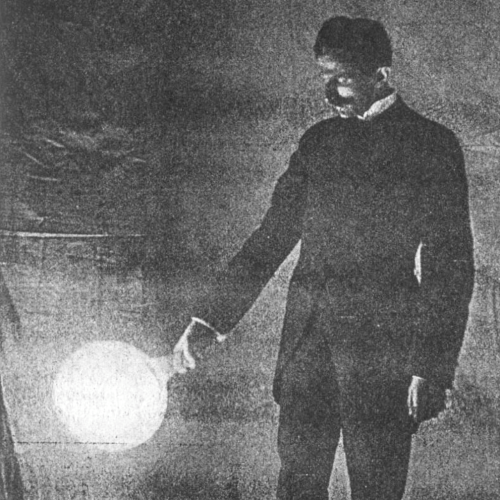 From time to time Tesla has made partial announcements as his work progressed. This, however, is the first comprehensive account of his system as a whole that the inventor has consented to give to the world. “Through ages past man has anyways attempted to project in some way or other energy into space. In all his attempts, no matter what agent he employed, he was hampered by the inexorable law of nature which says every effect diminishes with distance, generally as the square of the same, sometimes more rapidly. “I saw at once that space was annihilated in all the three aspects; in the transport of our bodies and materials and in the earth, transmission of the energies necessary for our existence. You can imagine how profoundly I was affected by this revelation. 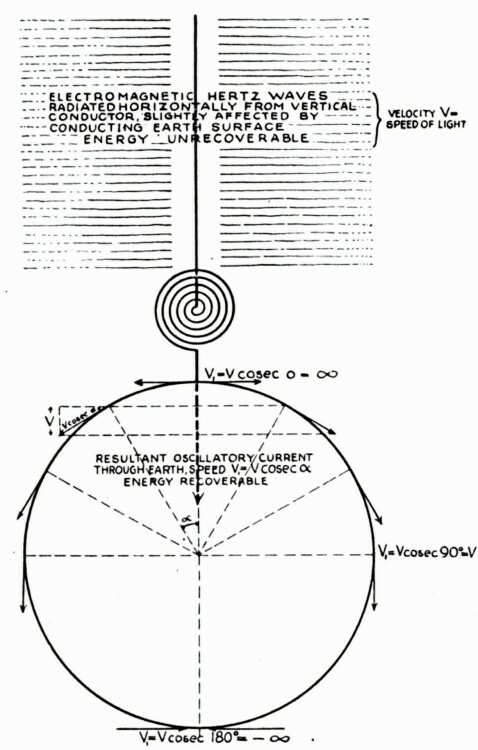 Technically, it meant that the earth, as a whole, had certain periods of vibrations, and that by by impressing electrical vibrations of the same periods upon it, it could be thrown into oscillations of such nature that innumerable benefits could be derived. “It is difficult to convey an idea of these inventions without resorting to technical terms. The first and best known of these is my transformer, which enables the production of electrical vibrations of transcending intensities. I have already attained activities of many millions of horse power; but this is nothing compared to those which I am expecting to get with my improved apparatus. “The second is what I have termed my magnifying transmitter, which I look upon as my best electrical invention, and with which any distance can be bridged. I have already passed of this wonderful instrument and am confident that a message can be flashed to such a distance as the planet Mars. What would the voltage in your transmitter be? How will your “World System” compare with those now in use as regards to cost? How long does it take for the transmission of a message, by your system, around the world? “The exact time is, according to my measurements, 43-1000 of a second, which is a speed about 50 per cent greater than that of light. “The impulse starts from my magnifying transmitter with infinite speed, slows first rapidly and then at a lesser rate until, when it has penetrated to a distance of 6000 miles from the transmitter, it proceeds with approximately the speed of light. From there on it accelerates, first slowly and then more rapidly, and reaches the opposite point of the globe again with infinite speed only to rebound and pass through the same phases on its way back to the transmitter. Is your universal marine service based upon this principle? When your system of time distribution is introduced what kind of devices will be used for indicating the hour? “They will be ever so much simpler than the ordinary clocks or watches, being entirely devoid of wheel work. For personal use a small case will be provided resembling that of a watch which would indicate precisely the time and require no more attention than a compass for instance. The large clocks on towers and public edifices in general will be replaced by extremely simple devices operated on the same principle. In operating stock tickers, will the present instruments have to be replaced by others? Will the transmission of complex musical productions require complicated apparatuses? “Not at all. 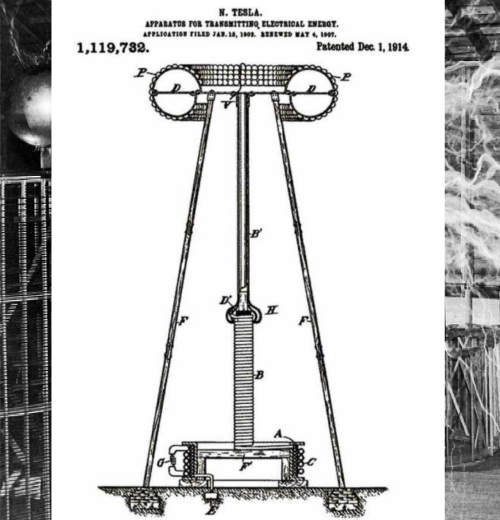 The apparatus at any of the master plants, transmitting a great number of musical compositions, will be of necessity complicated, but the subscriber will need only a telephone receiver, and, if he desires exclusiveness, and individualizing device in connection, which, however, will be rarely required. He will be none the less able to listen to the most complex opera played in some remote party of the world. What is more, he can carry the entire outfit with him on his walks and travels, and whenever he desires to listen to the music he can do so. How far from the Earth’s surface can power be transmitted by this wireless system? What do you consider the most important application of your system? "The transmission of power, of course. The operation of aerial machines alone will be of a revolutionizing influence, in as much as it will afford a perfect solution of this important problem. By Marcel Roland. New York American, September 3, 1911. If Trump FCC chairman Ajit Pai had confined his attack on Net Neutrality to merely rolling back the 2015 Title II rules, he might have gotten away with it; but like the Republic plan to kill Obamacare, the Republican plan to rob the middle class to enrich billionaires, and, well, every other Republican plan in this administration, Pai’s plan is so grotesque, so overreaching, so nakedly corrupt that it is likely to collapse under its own weight. That’s because the Supreme Court has held that a federal agency contemplating a significant change in policy must “examine the relevant data and articulate a satisfactory explanation for its action.” But there are no new facts in evidence since the first Net Neutrality rules were enacted in 2004 to justify a change. We don’t know what evidence Pai will bring to court when it comes time to fight his plans, but the cards he’s played so far are hilariously weak: for example, he claims that the 2015 Title II rule led to a decrease in infrastructure investment by telcos. In fact, the telcos’ own filings and investor calls reveal that the reverse is true (Pai is entitled to his own opinions, but not his own fact). The other structural strength of the US system is the independent courts who act on a well-litigated Constitution whose jurisprudence is voluminous, and who have the power to overturn both the administrative branch and Congress. Again, these are far from perfect, but they are an important check on the abuse of political power, and they are much more readily available to the public than the other two branches. To saw Congress, you have to buy a majority of Congressjerks with campaign contributions; to capture a regulator, you must represent an industry that can offer them lucrative employment after they leave government life; to use the court to neutralize these other branches, you need only convince three appeals court judges or five Supremes that the Constitution supports your position. While the courts are packed with Republican appointees (thanks to GOP Senate dirty tricks in refusing to approve judicial appointments under Obama, all the way up to a vacant Supreme Court seat that Trump stole), there is a well-established moderating effect of judicial service on long-serving judges, because working your way up through the federal courts requires a showing of adherence to the Constitution, which, overall, favors policies at odds with the right-wing agenda. This means that when Pai’s plan gets to the courts, it stands a good chance of being struck down – and in any event, the court battle may last until 2020 and serve as a good argument to spur voters to vote against Trump and thus change the FCC leadership, mooting the whole point. With the excitement already building for the year-end release of the latest “Star Wars” film, the new video game “Star Wars: Battlefront II” was poised to capitalize on all the excitement for the vaunted Disney franchise.